As a masticating juicer, the Breville BJS600XL Fountain Crush Masticating Slow Juicer is much quieter and more efficient than centrifugal juicing models. This means you won’t disturb others in your home when you are using it and you’ll get the maximum amount of juice from your fruits and vegetables. The higher juice yield also means you’ll use less produce for each glass of juice you make, which can add up to significant savings over time. Plus, the middle-of-the-road price tag is attractive to those shoppers who want value as well as premium functionality. So, let’s fire up the Breville BJS600XL Juicer and take a closer look. Why do we love this juicer? As you may know, masticate means “to chew.” Accordingly, masticating juicers are designed to accept fruits, vegetables and leafy greens through a screw-like auger that “chews” them up to extract every possible drop of juice. 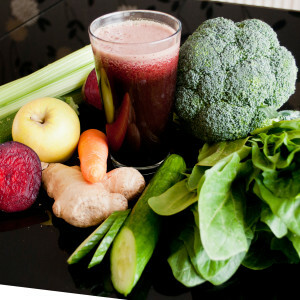 The result is a richer tasting, healthier and more nutrient-filled juice than you’ll get with a centrifugal machine. 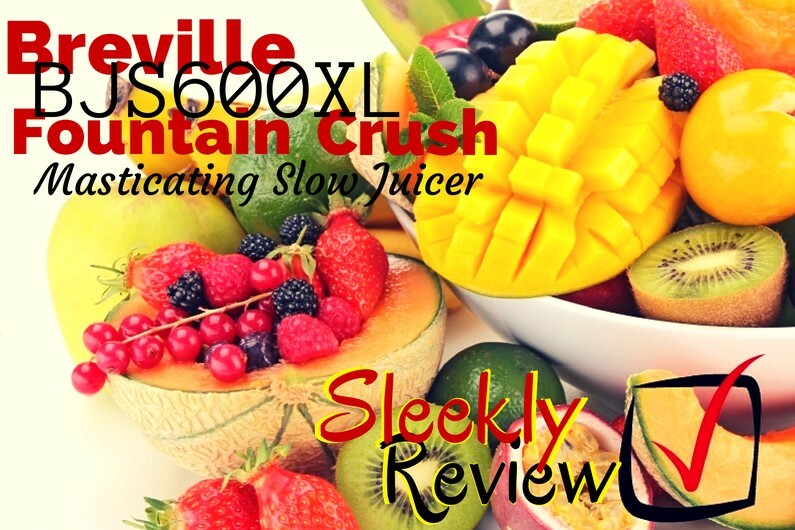 Overall, those who have purchased and reviewed the Breville BJS600XL Fountain Crush Masticating Slow Juicer are pleased with their purchase. With a respectable customer rating on Amazon, this unit obtained high marks for its quiet operation, extremely high juice yield, and the ability to effectively juice leafy greens. Its space-saving, compact design and long-lasting titanium cutting disc, which is protected by a one-year warranty, are also very popular features of this product. As an added bonus, its convenient reverse mode is a feature not found on most juicers. This feature offers a safe and quick way to get fruits and vegetables loose if they become stuck. No product is 100% perfect for every buyer, and the Breville BJS600XL Fountain Crush Masticating Slow Juicer is no exception. One drawback of this unit is it is slow to operate. The best way to juice your favorite vegetables and fruits. Due to the way masticating juicers are made, they slowly extract as much juice as possible from fruits, vegetables and leafy greens. This means a little more time invested on your part. However, this negative is what gives you the highest juice yield for your fruit and vegetable shopping dollar. 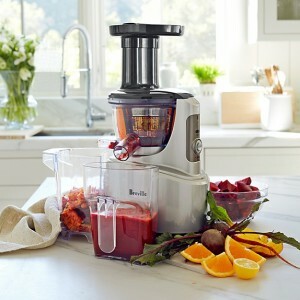 For this reason, the Breville BJS600XL will pay for itself a lot faster than a centrifugal juicer will. Plus, you’ll be rewarded with richer and less oxygenated juice for your efforts. If you are looking for an affordable juicer to get as much possible juice out of your food items while utilizing a small amount of space, this model deserves your consideration. With a mid-level price tag and a broad array of attractive features, the Breville BJS600XL Fountain Crush Masticating Slow Juicer is a quiet, compact and efficient machine that can handle all of your healthy juicing needs. Finally, if you need some inspiration on what to make with your new juicer, pick up a copy of the aptly named “Juicing Bible.” This popular and highly rated juicing book won the 2000 International Cookbook Revue and has more than 500,000 copies in print. With 350 juicing recipes to choose from, this affordable accessory will transform you into a juicing veteran in no time.